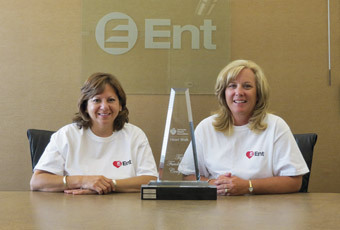 Ent’s Heart Walk team co-chairs, Joan Taylor, director of lending projects, and Marilynn Davis, director of card and ATM services, pose with the “Top Company” award for the 2012 Colorado Springs Heart Walk campaign. Associated Credit Union Foundation, Marietta, Ga., donated $11,000 to Operation HomeFront Georgia during its annual “Making Caring Count Golf Tournament” at Dunwoody Country Club. Operation HomeFront’s provides emergency services and morale support for Georgia military families and wounded soldiers.